Chronic pain is predicted to reach epidemic proportions in developed countries with ageing populations in the next 30 years. Chronic neck pain is a highly prevalent condition, affecting 10–24% of the population. Low-level laser therapy (LLLT) uses laser to aid tissue repair, relieve pain, and stimulate acupuncture points. Laser is light that is generated by high-intensity electrical stimulation of a medium, which can be a gas, liquid, crystal, dye, or semiconductor. The light produced consists of coherent beams of single wavelengths in the visible to infrared spectrum, which can be emitted in a continuous wave or pulsed mode. Surgical applications of laser ablate tissue by intense heat and are different from LLLT, which uses light energy to modulate cell and tissue physiology to achieve therapeutic benefit without a macroscopic thermal effect (sometimes termed cold laser). 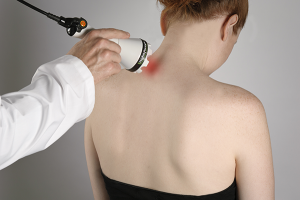 LLLT is non-invasive, painless, and can be easily administered in primary-care settings. Incidence of adverse effects is low and similar to that of placebo, with no reports of serious events. We searched computerized databases comparing efficacy of LLLT using any wavelength with placebo or with active control in acute or chronic neck pain. Effect size for the primary outcome, pain intensity, was defined as a pooled estimate of mean difference in change in mm on 100 mm visual analogue scale. We identified 16 randomized controlled trials including a total of 820 patients. In acute neck pain, results of two trials showed a relative risk (RR) of 1·69 (95% CI 1·22–2·33) for pain improvement of LLLT versus placebo. Five trials of chronic neck pain reporting categorical data showed an RR for pain improvement of 4·05 (2·74–5·98) of LLLT.